Across the country, many MC Canada churches are staring at the numbers and scratching their heads. As young people drift away from the church and the baby boomers retire, church leadership is faced with increasing numbers of grey heads. Those faithful church founders, so consistent in attendance and giving, have reached the declining years. For decades, they were the backbone of the congregation as they taught Sunday School, served on committees and worked with the youth. They gave vision and energy to the church of their day. Now, having given their best years to their church families, these precious souls spend quiet days quilting, or meeting friends for coffee. And they pray. They pray for their children, they pray for their grandchildren and they pray for the pastor. They’ve traded board chair for rocking chair and, no longer able to contribute to the life of the church as before, this demographic now needs, in varying degrees, to be cared for by others. So besides building Mennonite Nursing Homes and seniors complexes to provide safe havens for their final years, what more can the church be doing? John Neufeld, former president of Canadian Mennonite Bible College, recently spoke on the assembly floor of the Mennonite Church Canada sessions in Waterloo Ontario. He urged delegates to consider a bigger picture. “For years, we’ve talked about what we can do for the youth,” he said. What about our seniors? Neufeld, now in his seventies, has done a lot of thinking about the needs of his generation. His presentations on the needs of seniors can be found on the MC Canada Resource Centre website. But he does not put his focus on practical needs such as adding elevators to church buildings and hearing aids in pews. His assessment considers the mental and emotional health of seniors as well as social and physical issues faced by his peers. “The church needs to encourage seniors groups to think intentionally about living [out] their senior years,” he said, pointing out the numerous opportunities afforded to seniors simply due to having long hours to fill. One area we can work on, said Neufeld, is relationships. Whether it’s mending strained relationships from the past or working on our relationships with God, both are important. Work has also dominated our time so that people did not have time to deal with old memories. He stresses the importance of creating a safe place for seniors to talk about those past memories, without fear of judgement. Several years ago, after giving a talk about these concerns, a woman shared her experience of abuse with him, admitting she had never told anyone else about it. “Imagine, keeping a secret for six decades,” said Neufeld. In scripture, Jacob even sets an example when he faces his fear of meeting Esau after tricking his brother out of the birthright. Dealing with emotions that stem from “repeated grieving” is also a regular part of life for many seniors as they attend one funeral after another. Esther Patkau is the Spiritual Care Co-ordinator at Bethany Manor, a large senior’s complex in Saskatoon. She sees the elderly struggling to cope after a loved one dies. “Grieving can bring a person down to where they don’t function at all,” she observed. People, she said, want to be “accepted in their grief.” But sometimes, well-meaning friends derail the process through insensitive comments. Patkau, a former missionary, is often called upon to visit the dying in hospitals and then walk families through funeral preparations. In her job, she has dealt with 41 deaths in the past 10 months. Funerals are the biggest part of her role, but she knows that the simple act of being a caring listener can be very healing for people going through a loss and another vital aspect of her job. “The ministry of presence is very important,” she said. In addition to the mental and emotional challenges, many seniors struggle with reduced mobility, loss of driver’s license, isolation and declining health. They might need help with simple tasks like getting groceries or going to the doctor but find it difficult to ask for assistance. Pastoral staff, too, wonder how to balance the needs of their seniors with other age groups. They have limited time to visit and usually focus on crisis visits or palliative care visits of church members in the hospital. The worship needs of seniors also need to be considered. Seniors often find German or their mother tongue the most meaningful way to connect with God. And they prefer hymns over choruses. When a death occurs, the demands on the pastor are almost immediate. All other duties are pushed to the side and meetings with family members are quickly arranged to decide on funeral programs and burial plans. Artur Bergen, 52, is the pastor at Eben-Ezer Mennonite in Abbotsford, B.C. In a congregation of 350, almost 200, including shut-ins, are seniors. “What I see in many churches across Canada, and this concerns me, is we have “old” churches with seniors and we have “young” churches with young people . . . in some churches, seniors are pushed away. In some churches, seniors have pushed young people away,” he said. At Eben-Ezer, there has been a lot of work to avoid that. For about eight years, the Sunday morning worship involved a German and English message. “It wasn’t working well,” admits Bergen. A discernment process led to a new approach. “Now we have an integrated worship service,” he said. “We try to involve all ages.” The needs of different age groups are taken into consideration during the sermon time. Youth and children attend their own class. For the adults, there is a German class and an English class for spiritual input. The needs of the seniors are also important to leadership. For four years, they put in place a seniors’ pastor, but that recently changed because of budget constraints. However, on a Sunday morning, much effort is put into working with specific challenges. During the service, there is help for those who are far-sighted (power-points) and those who are near-sighted (bulletins), explains Bergen. But that doesn’t always work for everyone. “For some, they can’t follow the service, the program just goes by too quickly,” he said. In response, the church has developed a CD ministry. Copies for members to take home are made after the service and some copies are also brought to seniors who can’t get out. Another congregation in the Abbotsford area has hired a person specific to the needs of seniors. Laura Loewen, 66, works two days a week at Emmanuel Mennonite as the Seniors Ministry Coordinator. She knows the needs of seniors and sees the struggle for pastoral staff to balance those needs, especially with visiting. “With the older generation, the expectation is that the senior pastor should come; a pastor should be on call 24/7,” she says but knows that is unrealistic. At Emmanuel, the deacon groups step in the fill that need. First Mennonite Church in Saskatoon also values the contributions of its deacons. In a congregation where almost everyone is retirement age and older, the needs are great. They have developed the idea of visitation deacons. These are people, says Arnie Fehderau, pastor, whose role is simply to visit. At Mount Royal Mennonite church, Elsie Siemens is the Minister of Health. Her job description is based on the parish nurse idea. Siemens herself is a retired nurse and spends three days a week attending meetings at the church; visiting and trying to bring an educational component on preventative health to the seniors at Mount Royal Mennonite. But not all Mennonite churches embrace the concept of using a parish nurse to provide extra care. The idea was considered at the pastoral level at Foothills Mennonite but nothing came of it, said Doug Klassen. First Mennonite in Saskatoon had a parish nurse for one year but then discontinued the program. “People really didn’t think there was a need for it. It was not well utilized” said Heidi Bartsch who served in the position until she needed to care for her own parent’s ailing health. It’s hard for people to grasp that the church can offer more than spiritual care, she said. Loewen, herself, believes that the needs will continue to grow. “Because of the baby boomers, [the issue of senior care] is going to be huge,” she says. “MC Canada talks about using our gifts. In a traditional culture, that is where the wisdom is. How do we receive that, acknowledge it and use it? She asks. Across the country, in southern Ontario, St. Catherines United Mennonite Church has also developed a new approach to senior care. Ken Gazley, pastor, led the congregation through a situation that was reaching crisis proportions. “Six years ago, we had a hundred people in nursing homes,” he notes. The deacons struggled to keep up with the care needs of this age group. Together, the church looked in Acts 2 and the early church model of caring for each other to find a solution. Out of that, says Gazley, came the Caring and Connect program. A call went out for volunteers to help so that seniors who had needs could be paired up with a caring church member. High-needs individuals could be better served by the deacons and pastors. Gazley held a training session for the volunteers. The only requirement was two visits a year. “Most are exceeding that,” says Gazley. In total, a group of 33 Care and Connect visitors effectively cares for over a hundred seniors in a church of 450 members, he said. If others churches approach St. Catherines United Mennonite to learn about their success, he is careful to tell them that one size does not fit all. Another way volunteers can care for their elderly friends is to bring them a CD of the morning service. At some point in the future, the church hopes to make DVD’s of the service as well. But not all seniors need or even want care. In one Prairie congregation, the group of recent retirees shuns the typical seniors label and has opted for something that defines them more clearly. At Foothills Mennonite in Calgary, they call themselves Unrestricted By Jobs (UBJ’s). They are not hampered by health concerns. This is a different class of elders altogether. They are the New Seniors. “Those in their 50s and 60s are very mobile,” said Doug Klassen, pastor. A fact, which, he notes can be disruptive to the life of the church. Describing that age group as being more independent than the older generation at Foothills, Klassen wonders if their career success and status contributes to their independence. “It’s a tricky and sensitive thing,” he said describing the relationship between recent retirees who are chafing to live out their retirement years in freedom versus practising accountability to the church body. Will Loewen, pastor of Trinity Mennonite, a church set picturesquely in a wheat field close to Calgary city limits, puzzles too over how to help the seniors in the congregation. “We want to give the help we’re experienced to give, but what happens if the seniors don’t want it? he asked, noticing the reluctance of some seniors to ask for help. Perhaps no one has put it more succinctly than Renata Klassen, Mennonite Church Saskatchewan moderator. In a recent consultation for MC Sask members, she made the direct correlation between this passing generation and reduced funding for programs. It is no secret that this has largely been the generation that has worked hard yet lived frugally. They have carefully saved and now, have been so generous with their wealth. “It is clear to us in MC Sask that we have an aging population. This has implications for the future,” she said. Herman Wiebe, pastor of Zion Mennonite in Swift Current, agrees. “It’s a big issue for the conference because that’s the age [group] that supports the conference,” he said simply. 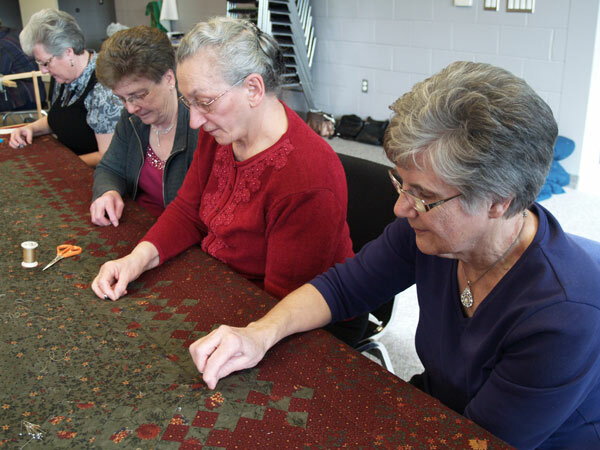 Martha Brubacher, Florence Frey and Vera Martin work on a relief sale quilt at Floradale Mennonite Church. Thank you for the much needed service to seniors. I feel they have been forgotten in my community. My mother is a Mennonite living in a Nursing home in Saskatoon, Sask. I am trying to find a place I can purchase Mennonite hymns in low or high german for my shut in mother. She responds very well to her first language-low german (or high german also when reading the bible). Is there a place I can purchase German Mennonite music/hymns and a German Bible(or parts of it ) on CD?